Since 1992, MITRE's Nanosystems Group has been performing broadly based research and development (R&D) in nanotechnology, with a focus on systems engineering that starts at the molecular scale. MITRE's James Ellenbogen and Carl Picconatto won Tech Patent of the Year at the 2017 Northern Virginia Technology Council (NVTC) Tech Awards. The award was presented at this year's NVTC annual banquet in December. Ellenbogen and Picconatto are co-inventors of a system for bulk separation of single-walled tubular fullerenes using a channeled substrate. The NVTC Tech Awards honors groundbreaking companies, leaders, and innovations in the northern Virginia region's technology community. Our inter- and multi-disciplinary work includes the development of systems such as nanoelectronic computers, nano-enabled energy and power storage devices, and millimeter-scale robots. Our researchers also have access to state-of-the-art facilities in MITRE's Biotechnology and Nanotechnology Lab on our campus in McLean, Virginia. 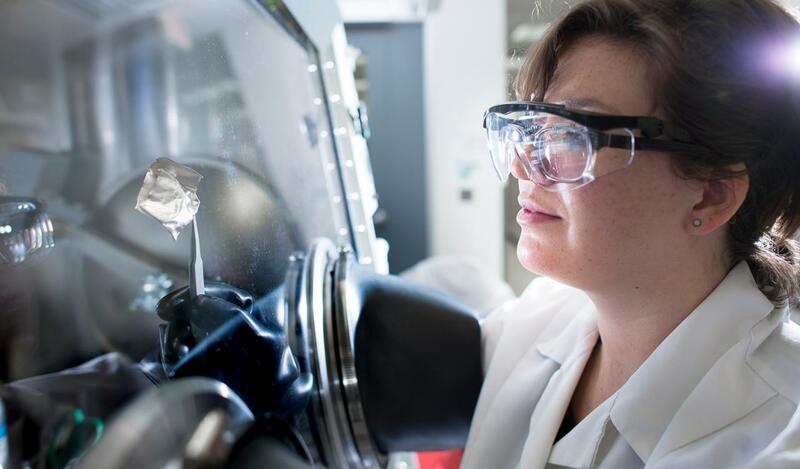 At MITRE, nanotechnology is defined as engineering on the molecular scale—i.e., using molecular-scale structures as the components of future systems that are designed and integrated on that same scale. This involves putting molecules and other molecular-scale structures, such as nanowires and quantum dots, where one wants them in enormous numbers. This permits the engineering of entire nanostructured systems of macroscopic extent from the bottom up. 1. Precise and arbitrary manipulation and positioning of large numbers of nanostructures. 2. The development of improved techniques for multi-scale modeling (i.e., unified approaches for the modeling across multiple scales of extended systems of nanostructures). 3. The design, fabrication, and demonstration of an extended nanocomputer system that is integrated on the molecular scale (i.e., the nanometer scale), including both an ultra-dense nanoprocessor and an ultra-dense nanomemory array. 4. Development of techniques for imaging atomic-scale features in real time under a wide range of conditions. 5. Better understanding of the health issues related to nanoparticles and other nanostructures. 6. Bulk synthesis or bulk separation of carbon nanotubes with controlled chirality. 7. Improved theories for understanding and predicting physical processes (chemical reactions, atomic transport, crystal structures, etc.) at nanometer length scales. MITRE is conducting extensive R&D to address some of the challenges listed above. Learn more about MITRE research and development programs in technology.